How delete the noice in hp printers for home, the next steps you solve the problem. The C084000A and C0840001 errors in the D1660 and F2180 HP printers are really common, even more when these printers are out of warranty it means they are old, these mistakes are from factory. We would recommend to get in contact with the HP support service, also revise if the printer is still in warranty time, with this error printers sound like if they were gun machines, although after this they print well but before printing well these printers make a fierce noise, it can almost be considered as getting broken somehow. In the following post we will present what really makes the noise and also who it is possible to solve the problem. Before continuing check if the printer makes a noise hitting against the wall where the cartridges are placed, in that case verify what locates the cartridges and eliminate the error. Since we can identify the error is actually the sound of machine gun before printing proceed with the solution. We opened the door which gives access to the ink cartridges, normally this door is in the front of the printer and it opens to the front and the cartridges are positioned where they can be easily taken out. See image below example D1660 HP printer. After opening the door that gives access to the cartridges take out the cartridges, to work and move the cartridge carriage to do so they have to be taken out, it has to always be remembered to take care of the circuits of the cartridges and place the cartridges where their connectors do not get damaged and neither their head touch any other object, that could lead the cartridges to spill ink. Now unplug the printer from the power supply, but it has to be unplugged without turning it off by using the ON/OFF button, with this what it is trying to be reached is that the printer leaves the cartridges in the center of the carriage, so the cartridges come out. We must try to put the cartridge carriage to the left, it means move the cartridge carrier to the left of the printer. We will work on the right side and do not want to deprogram the printer carriage. Carefully look at the right side of the printer, where the cartridges are placed and see a kind of carriage that cleans the ink cartridges when they get this side, actually this is the piece that makes so much noise, it seems to be that while time pass by and much work has been given leads this piece to fail. To do so the next step is to check again that the printer is unplugged from the power supply and introduce the hand trying to move the carriage that cleans the cartridges. It is advised to use gloves because this area is totally full of ink. The piece it means the carriage that cleans the cartridges has to move forward and backwards, maybe the first time it becomes a little difficult and hard but later it will have a bit softer solution, remember to move it backward and forward. see image of the piece inside the printer. In case the info provided gives you no solution at all, write a comment in this post, we will be pleased to help you meeting your need. Also you can be interested in refilling the 60 HP ink cartridges black and in how to refill the 60 HP tricolor ink cartridge. 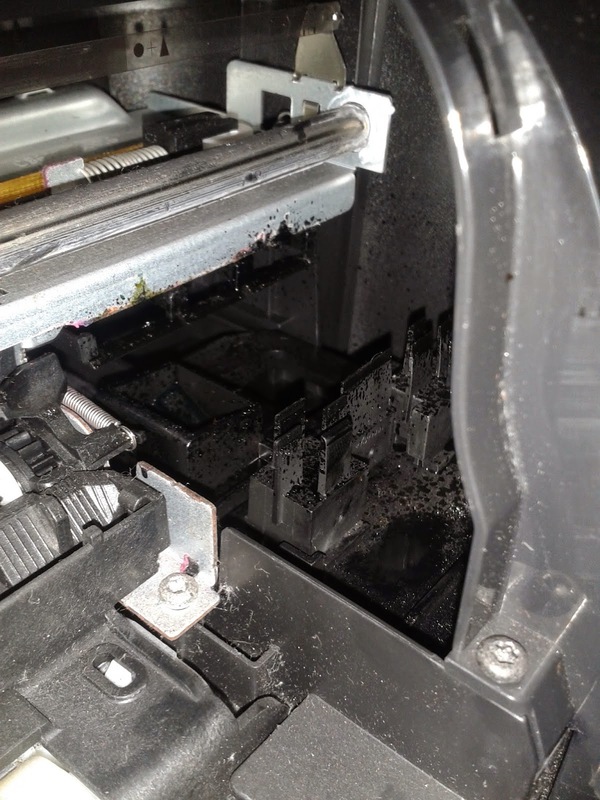 In case the printer blinks when placing the cartridges in again it is recommended to clean the connectors of the ink cartridges.